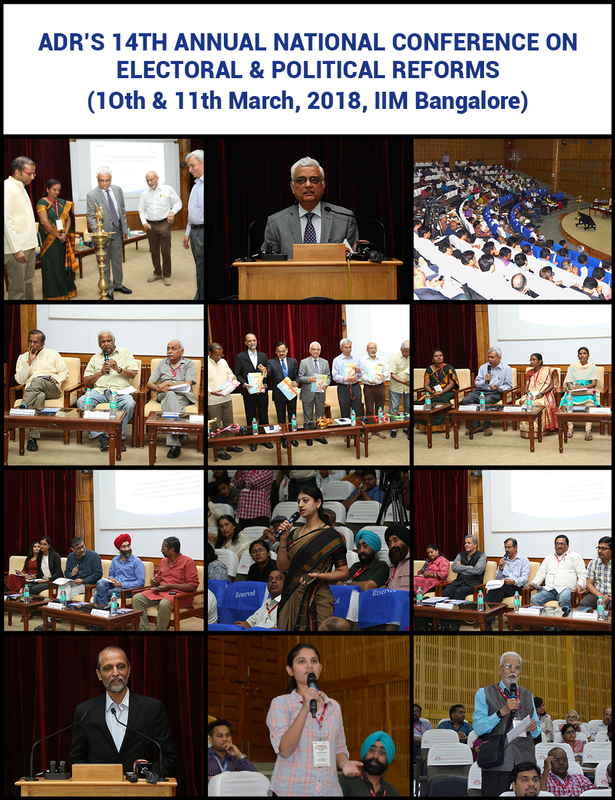 Bangalore, 11th Mar 2018: The Association for Democratic Reforms (ADR) and the Karnataka Election Watch (KEW) organized the 14th Annual National Conference at IIM Bangalore on the 10th and 11th March 2018. The two-day event focused on the grave necessity to address the most pressing problems in the electoral and political arena. State Election Watch coordinators from almost all the states in India participated in the event, along with, members from various civil society groups, social activists, journalists, retired bureaucrats, political party representatives, academicians and students from across India. The Chief Election Commissioner, Shri O.P. Rawat inaugurated the two-day conference and addressed the audience. He appreciated the ongoing efforts of ADR and National Election Watch (NEW) in carrying forward the civil society movement for electoral and political reforms. While addressing the audience, he stated that the Commission has made several important proposals related to areas ranging from decriminalization of politics to reforms relating to political parties, election expenditure regulation and election management issues. The CEC said that persons with serious offences should be debarred from contesting elections if charges have been framed by a competent court provided the offence is punishable by imprisonment of at least 5 years and the case is at least 6 months prior to the election in question. The CEC also proposed to make bribery a cognizable offence and countermand elections on grounds of bribery. Pertaining to reforms in political parties, the CEC stated that the ECI should be authorized to issue necessary orders regulating registration and de-registration of political parties as many political parties register but never contest any elections perhaps to only avail the income tax exemptions afforded to the parties. Furthermore, the Commission proposed that income tax exemption should be available only to political parties that contest elections. The CEC also said that parties should be statutorily required to submit their audited accounts to the ECI. Furthermore, a panel of accountants maintained by the Comptroller and Auditor General should audit these accounts and make them available in the public domain for further scrutiny. The CEC also said that the Commission has proposed that there should be a ceiling on the election expenditure of political parties in order to maintain a level playing field and control the use of money power in elections. Regarding Electoral Bonds, the CEC told the audience that the Commission has written to the Government of India (GoI) drawing attention to the amendment to Section 29C of the Representation of People Act (RPA), 1951 carried out vide the Finance Act, 2016 that excludes electoral bonds from the requirement of reporting. The CEC said that this would affect the transparency of political finance. The Commission also recommended reconsidering the amendments introduced in the Companies Act omitting the limit of 7.5% of companies’ average net profits in the preceding three financial years. The Commission suggested that a provision should be made in the Companies Act to declare party-wise contributions made by companies in the profit and loss account, in order to bring transparency in the fundraising of political parties. The CEC concluded by requesting the participants gathered for the conference to contribute to their fullest in the discussions to bring out comprehensive and workable proposals to improve our elections and governance at large. The two-day conference consisted of panel discussions on various important issues related to electoral and political reforms like the impact of muscle and money power in elections, legal advocacy as a tool for electoral reforms, Political reforms and the role of media, exceptions to use of money power in elections and success stories. Day 2 had topic discussions on information technology and it’s usage for better governance and the role of youth in voter awareness. Chairing the session on the impact of muscle and money power in elections, Prof. Trilochan Sastry, founder member and trustee ADR said that the root cause of corruption in the country today is the misuse of money power in elections. Candidates who spend crores of money focus more on recovering that money after winning than on development and good governance. Speaking on the same issue, Mr. Brijesh Kalappa from the INC said that doubts raised on EVM manipulation should be fully resolved and until then ballot papers should replace them. Mr. G.N. 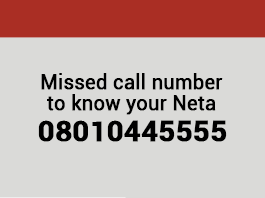 Nagraj, state secretary, CPI (M) suggested that electoral bonds and the recent FCRA amendments should be done away with and corporate funding should be banned. He recommended that there should be a system of state funding for elections. Also on the panel were Mr. Mahima J Patel, State President, JD (U), Mr. Yashwant Deshmukh of C-Voter and Mr. Tanveer Ahmed, National Spokesperson, JD (S). Mr. Deshmukh said that in his experience conducting surveys for the past 25 years he has discovered that musclemen are winning because they are seen as capable of delivering and providing results to their voters and are winning repeatedly due to their popularity factor and not due to any fear as generally perceived. Mr. Ahmed urged the voters to avoid inviting politicians as chief guests in social functions, inaugurations etc. Mr. Patel agreed that if NOTA takes the lead then there should be re-elections and the losing candidates should not be allowed to contest again. Prof. Jagdeep Chhokar, founder member and trustee ADR, chaired the session on legal advocacy as a tool for electoral reforms. After introducing the panelists he stressed on the importance of legal advocacy and gave the example of how Lok Prahari has utilized legal mechanisms to achieve crucial electoral reforms. The Supreme Court of India recently pronounced a favourable judgement in a writ petition filed by Lok Prahari, seeking disclosure of the sources of income of candidates contesting elections at the time of filing nomination. The petition was filed in the context of alleged substantial increase in the assets of MPs and MLAs. Discussing legal advocacy as a tool for electoral reforms, Mr. S.N. Shukla, General Secretary, Lok Prahari said that the elected representative should be a person of character and integrity. He strongly believed that legal advocacy is the ultimate tool and hope for electoral reforms in our country. Mr. Harish Narasappa, co-founder Daksh and KEW state coordinator recommended that we should stop filing ad hoc petitions and that we need more considered and organized approach before approaching the courts. Another very important panel discussion was on political reforms and the role of media. Speaking on which, Ms. C. G. Manjula, Views Editor, Prajavani said that free press is the most cherished freedom inherent in modern society. As the endemic of fake news has become a global malice, the free press has become much more important these days. Mr. Ramakrishna Upadhya, Senior Journalist, TV9 said that there is gross misuse of money power in elections these days and there is no transparency in campaign finance. Senior Independent Journalist and Author, Mr. Manoj Mitta suggested that crimes pertaining to hate speeches made by the candidates and representatives of political parties should be taken more seriously and a compilation should be made to help media take up a focused campaign against hate mongers. Focusing on the use of IT for better governance, Ms. Deepti Bharthur, Senior Research Associate at IT for Change said that IT plays a crucial role in improving governance. Through a feedback mechanism voters can express their expectations and provide feedback to their representative for accountability. Ms. Manasa Venkataraman, Research Associate, Takshashila Institution expressed that channelizing ICT for better governance is a big challenge in India and we need to make government schemes more robust for efficient delivery. Mr. Jaskirat Singh, founder Webrosoft Solutions and trustee ADR, said that IT is a very effective multiplier tool and plays a very important role in advocacy campaigns for ADR. The two-day national conference concluded with Mr. Harish Narasappa thanking all the panelists, participants, the ECI, IIM Bangalore, Team Daksh and ADR for making this event a success.